Methuen is a city in Essex County, Massachusetts, United States. The population was 47,255 at the 2010 census. Methuen was first settled in 1642 and was officially incorporated in 1726. Methuen was originally part of Haverhill, Massachusetts. In 1724 Stephen Barker and others in the western part of that town petitioned the General Court to grant them permission to form a new town above Hawke's Meadow Brook. Although opposed by their fellow townsmen, the petition was approved the following year (December 8, 1725), and the General Court gave them an act of incorporation under the name of Methuen. The town was named for Sir Paul Methuen, a member of the King's Privy Council and friend of acting Provincial Governor William Dummer. The first town meeting was held March 9, 1726. Industrial growth in the 1800s influenced Methuen's development. Construction of the Methuen Cotton Mills at the Spicket River falls in the 1820s and the increased manufacture of hats and shoes in small factories along the Spicket spurred the centralization of Methuen's economic, residential and cultural activities within the area around Osgood, Broadway, Hampshire and Pleasant streets. Three wealthy and prominent families—the Nevins, the Tenneys and the Searles—played a significant role in Methuen's history and development. These families were instrumental in the founding of many of Methuen's landmarks, including the Nevins Memorial Library, the Searles building, Tenney Gatehouse, Nevins Home, Spicket Falls, and the Civil War monument between Pleasant and Charles streets. Methuen is located at (42.730040, −71.179352). According to the United States Census Bureau, the city has a total area of 23.1 square miles (59.7 km2), of which 22.2 square miles (57.6 km2) is land and 0.77 square miles (2.0 km2), or 3.42%, is water. The town lies along the north banks of the Merrimack River, and is also bisected by the Spicket (originally "Spigot") River, as well as many brooks and streams. There are several ponds dotting the area as well, and the town is home to a town forest, a bird sanctuary, and a small state park (Tenney State Park). Pine Island, near the southern end of town in the Merrimack River, is also part of the town's land. Methuen lies along the northwestern edge of Essex County, just east of Middlesex County and just south of Rockingham County, New Hampshire. The irregularly-shaped town is bordered by Haverhill to the northeast, North Andover to the east, Lawrence and Andover to the south, Dracut (Middlesex County) to the west, Pelham, New Hampshire (Hillsborough County) to the northwest, and Salem, New Hampshire (Rockingham County) to the north. Methuen is located 30 miles (48 km) north-northwest of Boston and 25 miles (40 km) south-southeast of Manchester, New Hampshire. Methuen lies at the northern end of Interstate 93 in Massachusetts, with three exits providing access. A portion of Interstate 495 crosses through the eastern side of town from Lawrence to Haverhill. Massachusetts Route 213, the "Loop Connector", provides highway access between the two, lying entirely within town and having five exits of its own. The town is also crossed by Route 28, Route 110, and Route 113, the latter two meeting at a rotary at I-93 Exit 46, one of the more congested intersections along the I-93 corridor. Construction to replace this interchange began in July 2014; it is expected to be complete at some point in 2017 with a partial cloverleaf interchange. I-93 provides the town's only bridge across the Merrimack; there are several crossings in Lawrence, and several in neighboring Haverhill, but none for 7 miles (11 km) upstream from I-93 all the way to the eastern end of Lowell. Methuen is served by the Merrimack Valley Regional Transit Authority's bus service; there is no other mass transportation source within town. The nearest rail station is in South Lawrence, which is part of the Haverhill/Reading Line of the MBTA Commuter Rail, providing service into Boston's North Station. Small plane service can be found at Lawrence Municipal Airport and the Merrimack Valley Seaplane Base, with the nearest national service being at Manchester-Boston Regional Airport, and the nearest international service being at Logan International Airport. As of the census of 2000, there were 43,789 people, 16,532 households, and 11,539 families residing in the city. The population density was 1,954.7 persons per square mile (754.8/km²). There were 16,885 housing units, at an average density of 753.7 per square mile (291.0/km²). The racial makeup of the city was 89.35% White, 1.35% African American, 0.22% Native American, 2.38% Asian, 0.01% Pacific Islander, 4.87% from other races, and 1.82% from two or more races. Hispanics and Latinos, of any race, were 9.64% of the population (8.4% Dominican, 5.7% Puerto Rican, 0.6% Guatemalan, 0.3% Ecuadorian, 0.3% Mexican, 0.3% Cuban). There were 16,532 households, of which 33.1% had children under the age of 18 living with them, 53.3% were married couples living together, 12.2% had a female householder with no husband present, and 30.2% were non-families. 25.3% of all households were made up of individuals and 11.6% had someone living alone who was 65 years of age or older. The average household size was 2.62 and the average family size was 3.17. In the city the population was spread out with 24.7% under the age of 18, 7.3% from 18 to 24, 31.0% from 25 to 44, 21.6% from 45 to 64, and 15.3% who were 65 years of age or older. The median age was 38 years. For every 100 females there were 91.9 males. For every 100 females age 18 and over, there were 87.0 males. The median income for a household in the city was $49,627, and the median income for a family was $59,831. Males had a median income of $41,693 versus $31,864 for females. The per capita income for the city was $22,305. About 5.8% of families and 7.4% of the population were below the poverty line, including 9.7% of those under age 18 and 7.7% of those age 65 or over. 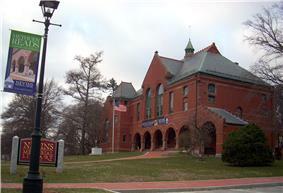 Historically, Methuen had a town meeting-selectmen form of government and was known as the Town of Methuen until it adopted a charter replacing its traditional town meeting and selectmen with a council and manager. Even with a form of government that had historically and legally been exclusive to cities, the community, in a gesture of traditionalism, retained the name Town of Methuen in its charter. However, because Massachusetts cities have self-governing powers not available to towns, it became known for legal purposes as "The City Known as the Town of Methuen". 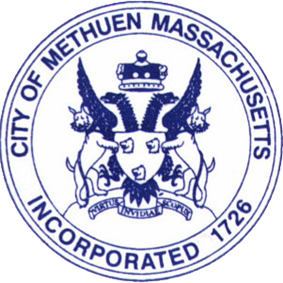 A subsequent charter, which adopted a strong mayor form of government, officially changed the community name to the "City of Methuen". Methuen's city government consists of a mayor, three Councilors-at-Large, two East District councilors, two Central District councilors, two West District councilors, and six School Committee members. The mayor of Methuen is Stephen Zanni. The at-large city councilors are Daniel Grayton, Joyce C. Campagnone, and James P. Jajuga. The Central District city councilors are James Atkinson and Lisa Yarid Ferry (Council Vice-Chairperson). The East District city councilors are Thomas Ciulla and Ronald Marsan (Council Chairman). The West District city councilors are George J. Kazanjian and Sean J. Fountain. The Islamic Academy for Peace is a private Islamic co-educational elementary and middle school founded in 2001. Located at 125 Oakland Avenue, it seeks to provide a foundation of academic excellence and Islamic values that enables young Muslims to become righteous leaders for the community. Saint Monica's is a Catholic K through 8 school run by the Sisters of Notre Dame. St. Ann's Home and School provides residential, outpatient, and private day school options for a wide range of learning disabilities and/or behavioral and emotional disorders. All programs are designed to provide a continuum of special needs services to assist children and adolescents who need intensive and comprehensive help for themselves and their families. The Day School program offers education for children and adolescents with special emotional needs, complemented by a strong therapeutic component. Children are transported to St. Ann's from communities in a one-hour radius. Referrals come from school districts seeking an academically focused, clinically supported school setting for students with significant emotional, developmental, behavioral, and learning needs. Presentation of Mary Academy is a private Catholic high school founded in 1958. The academy is on a 22-acre (8.9 ha) campus formerly known as the Edward F. Searles Estate. The school was originally for young women grades 9–12 but went co-educational with the 2011–2012 school year. Methuen High School's athletic teams play in the Merrimack Valley Conference. Their big rivals are the Andover Golden Warriors, the Central Catholic Raiders of Lawrence, and the Haverhill Hillies. On Thanksgiving Day, the football team plays fellow Merrimack Valley foe the Dracut Middies. The teams first met in a non-Thanksgiving Day game in 1935 and did not play again until the Thanksgiving series started in 1963. The school colors are blue and white, and their mascot is the Ranger, named after Rogers' Rangers, the precursor of the U.S. Army Rangers, which was founded by town resident Robert Rogers. The Searles Tenney Nevins Historic District, established by the city in 1992 to preserve the "distinctive architecture and rich character of one of Massachusetts' most unique neighborhoods", is named after the three Methuen city fathers: David C. Nevins, Edward F. Searles and Charles H. Tenney. Today, the trio's collective vision can be seen in mills, housing, schools, mansions, churches, monuments, playgrounds, the library, and the architectural fantasies that resulted from their artistic rivalry. The historic district boundaries were established to include properties and buildings constructed or used by the Searles, Tenney and Nevins families and the people who worked for them. The historic district is administered by the Methuen Historic District Commission, which protects the district from alterations that might compromise its historic integrity. Bounded within the Searles Tenney Nevins Historic District are the Spicket Falls Historic District and the Pleasant-High Historic District. Both are registered with the National Register of Historic Places, as are many of the other buildings within the area. Forest Lake is a recreational great pond of over 55 acres (22 ha) bordered by the Methuen town forest. Access is managed by the Forest Lake Association. Residents and visitors can engage in a series of activities, including fishing, canoeing, and swimming. J.S. Bach as a central ornament. The Methuen Rail Trail occupies the abandoned Boston and Maine Manchester and Lawrence Railroad corridor. It connects the Spicket River Greenway in Lawrence with the in-development Salem Bike-Ped Corridor. Future plans to revitalize this rail line for commuter and freight rail could make this trail a rail-with-trail bike path. The Nevins Memorial Library, founded in 1868 by David Nevins, Sr., was completed in 1883, two years after his death. The grand brick and stained glass library was listed on the National Register of Historic Places in 1984. Saint Basil's Seminary is the main US location for the Basilian Salvatorian Order, a community of religious priests of the Greek Catholic rite. St Xenia Orthodox Church, a multi-ethnic and multi-cultural parish of Russian Orthodox Church Outside Russia (ROCOR). The church hosts St. John of Damascus Church School. ^ "Mayor's Office". City of Methuen. Retrieved 17 September 2015. ^ Duggan, Tom (October 2013). "Who Will Lead Methuen? Steve Zanni and Jen Kannan Want Your Vote!". The Valley Patriot. Retrieved 17 September 2015. Zanni was an institutional Democrat with support from the party. 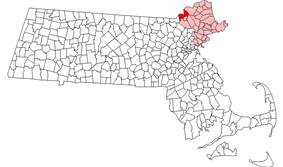 ^ a b Although it is called the "Town of Methuen," it is a statutory city of Massachusetts. See Office of the Secretary of the Commonwealth. ^ "Profile of General Population and Housing Characteristics: 2010 Demographic Profile Data (DP-1): Methuen Town city, Massachusetts". U.S. Census Bureau, American Factfinder. Retrieved August 30, 2012. ^ "City of Methuen, Massachusetts Profile" (pdf). Retrieved September 15, 2013. ^ "US Gazetteer files: 2010, 2000, and 1990". ^ "Geographic Identifiers: 2010 Demographic Profile Data (G001): Methuen Town city, Massachusetts". U.S. Census Bureau, American Factfinder. Retrieved August 30, 2012. ^ [anon] (1879). New England: A handbook for travellers. Boston: Houghton, Osgood and Company. p. 279. Retrieved October 28, 2010. ^ "Breakdown lane will be closed for rotary project in Methuen". Eagle Tribune. Eagle Tribune. Retrieved August 6, 2014. ^ "Methuen Rotary Project: Home". MassDOT. MassDOT. Retrieved January 27, 2013. ^ "TOTAL POPULATION (P1), 2010 Census Summary File 1". American FactFinder, All County Subdivisions within Massachusetts. United States Census Bureau. 2010. ^ "Massachusetts by Place and County Subdivision - GCT-T1. Population Estimates". United States Census Bureau. Retrieved July 12, 2011. ^ "1990 Census of Population, General Population Characteristics: Massachusetts" (PDF). US Census Bureau. December 1990. Table 76: General Characteristics of Persons, Households, and Families: 1990. 1990 CP-1-23. Retrieved July 12, 2011. ^ "1980 Census of the Population, Number of Inhabitants: Massachusetts" (PDF). US Census Bureau. December 1981. Table 4. Populations of County Subdivisions: 1960 to 1980. PC80-1-A23. Retrieved July 12, 2011. ^ "1950 Census of Population" (PDF). 1: Number of Inhabitants. Bureau of the Census. 1952. Section 6, Pages 21-10 and 21-11, Massachusetts Table 6. Population of Counties by Minor Civil Divisions: 1930 to 1950. Retrieved July 12, 2011. ^ "1920 Census of Population" (PDF). Bureau of the Census. Number of Inhabitants, by Counties and Minor Civil Divisions. Pages 21-5 through 21-7. Massachusetts Table 2. Population of Counties by Minor Civil Divisions: 1920, 1910, and 1920. Retrieved July 12, 2011. ^ "1890 Census of the Population" (PDF). Department of the Interior, Census Office. Pages 179 through 182. Massachusetts Table 5. Population of States and Territories by Minor Civil Divisions: 1880 and 1890. Retrieved July 12, 2011. ^ "1870 Census of the Population" (PDF). Department of the Interior, Census Office. 1872. Pages 217 through 220. Table IX. Population of Minor Civil Divisions, &c. Massachusetts. Retrieved July 12, 2011. ^ "1860 Census" (PDF). Department of the Interior, Census Office. 1864. Pages 220 through 226. State of Massachusetts Table No. 3. Populations of Cities, Towns, &c. Retrieved July 12, 2011. ^ "1850 Census" (PDF). Department of the Interior, Census Office. 1854. Pages 338 through 393. Populations of Cities, Towns, &c. Retrieved July 12, 2011. ^ "Registration and Party Enrollment Statistics as of October 15, 2008" (PDF). Massachusetts Elections Division. Retrieved May 8, 2010. ^ "Presentation of Mary website". Retrieved October 29, 2010. 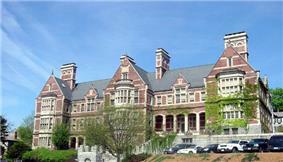 ^ "City of Methuen Website: the Historic District". Retrieved October 29, 2010. ^ "National Register Information System". National Register of Historic Places. ^ Gagnon, Don (2008). Methuen: An Eclectic History. The History Press. pp. 33–35. ^ Faggen, Robert (2001). The Cambridge companion to Robert Frost. Cambridge, UK: Cambridge University Press. p. 17.